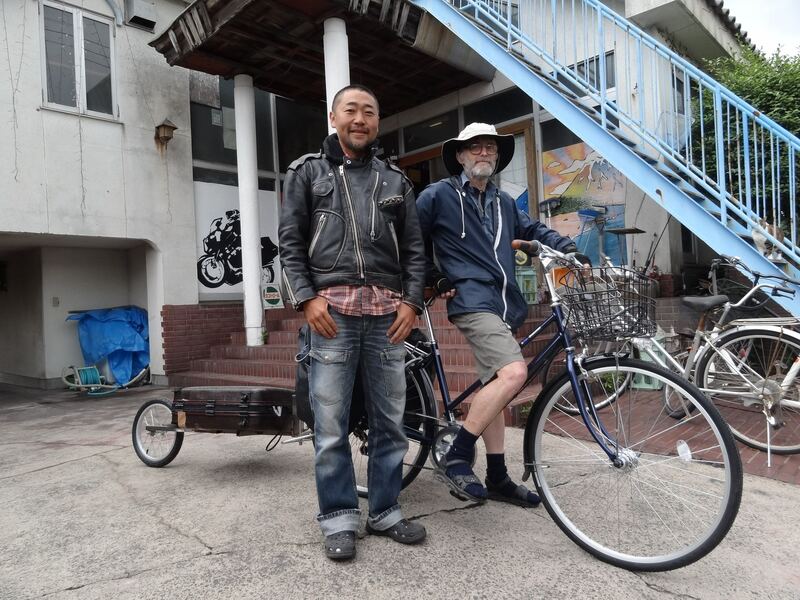 ← Introduction to Nigel’s 2012 Big Japan Bike Ride. Saturday 19th May. Flew down to Kagoshima City on the “Visit Japan” fare. Bags overweight, was ¥2000 for first 10kg so took it. Kawano-san was waiting having already gone on a previous flight. Check-in at Little Asia Guest House. Went straight to bike shop but buying a bike was not as straight forward as I hoped. Mama-chari axles are different size and width to sports bikes and cannot take the trailer. Was sent to a specialist bike shop but they said not possible to adapt. If I had kept the original hitch, which I change a week before leaving for Japan, it would have been OK.
Sunday 20th May. The manager says Little Asia is full so we have to leave. It is raining. Return on Sunday to discuss options with specialist bike shop owner. It is basically a ¥35,000 bike if it is to be strong enough to carry me, trailer and luggage to Hokkaido. This is about double the amount I thought would be adequate. He makes an excellent job of making a special hitch for the bike to pull the trailer, in double quick time. He doesn’t want the trailer. It was a good idea but is now like a millstone. I feel better when we get on our way. Take the ferry across Kagoshima Bay to Taramizu. Go to rider house and then to onsen. Kawano-san gives me a lesson on how to bathe properly – the towel is very important! With another guest at Taramizu. 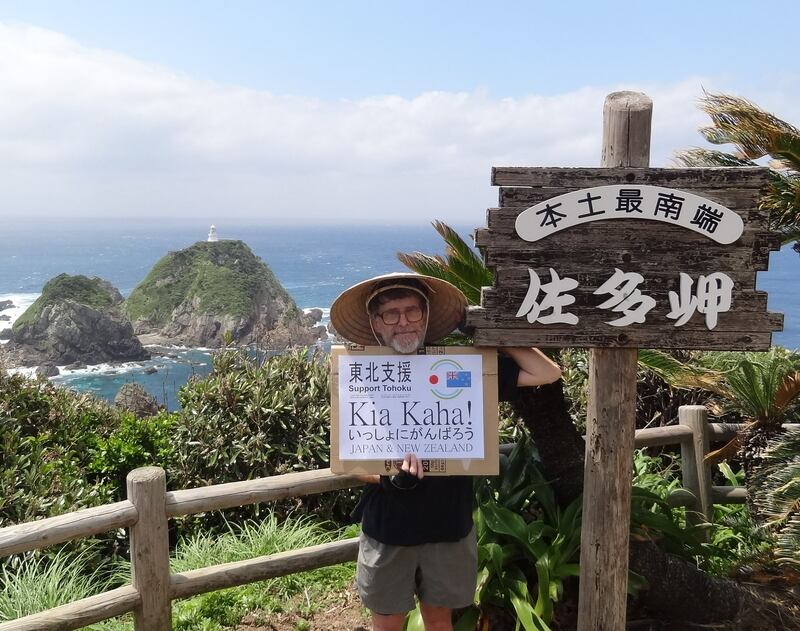 An American turns up who is a long time resident of Japan. Quite busy RH, it is not the best place I’ve stayed. Smoking allowed inside, no mattresses, with a hard floor to sleep on. Was also serenaded by an orchestra of snorers. Monday 21th May. Up for the 7:00am eclipse but overcast, went duller for a few minutes. Managed to see the dark sky through a gap in clouds. Leave late and cruise down to Sata Misaki. Rain starts again part way. Find the rail trail again only more of it. Arrive at Najime but too early to stop. Continue to Osumi and the last hotel. Struggle up some seriously big hills, not sure I can do it on a mama-chari with only 6 gears! Hotel is quite a pleasant place, only 15 years old, ¥5250 which is well over the amount I would prefer to pay. 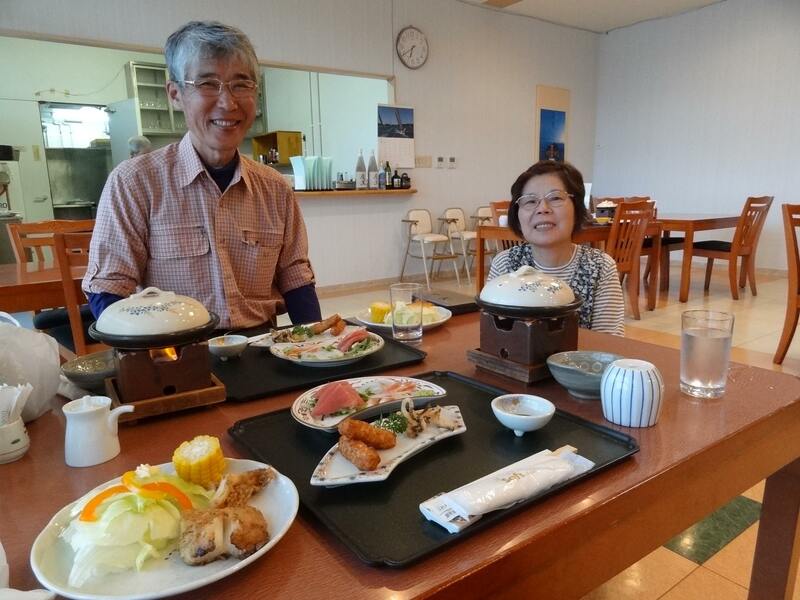 Kawano-san kindly offered to pay for the meals which we had been lead to believe were included and why I decided to proceed. Saw 3 cyclists, one of whom is staying at the hotel. Had after-meal drinks with him and another gent. Quite an amusing evening. Kawano-san and hotel staff at the last supper before the start of epic bike ride. Tuesday 22nd May. Arrived at Sata Misaki mid-morning after leaving the official sign at the hotel, and got a lift back to get it by the other gent from last night, when he came past in his car. We explore the area, the watchtower looks dangerous and is falling down! I am surprised it is still open. 11:00am and I’m on my way!